I was born in Utah, raised in Arizona and have lived in California since I married my husband in 1984. I’ve been a full-time writer since I was first published (by HarperCollins) in 1999. That was fifty books ago, and yet I still love to get up and go to the computer each day. Beyond writing, I enjoy socializing with my five kids, mountain biking, hiking, traveling, shopping and reading. I also love to play with my daughter’s dog, Simba. 1. What genre(s) do you write and why? 2. If you were to choose one superpower, what would it be? I’d freeze time and never grow old. Not only would I be able to avoid the aches and pains of old age, when it happens, I’d be able to stretch out a day for as long as I needed to. 3. Do you ever get stuck when you’re writing a book? What do you do to get “unstuck”? I start from the beginning and check the story as a plumber might check a series of pipes for leaks. I feel my way along, testing the story to see if it’s still “holding water.” I read, consider, read, consider and read some more until I find the “break” or part that isn’t in harmony with my intuition. Maybe I’m forcing my characters to do something these types of characters would never do. Maybe I’m ascribing a certain trait or pathology to my villain that isn’t ringing true. Maybe I’ve veered too far away from my “core story.” It’s a bit of a hassle to go back, and definitely risks some unraveling and rewriting, but if I take the time to do this I always find the point that’s troubling my subconscious and interrupting my ability to proceed. Then I can fix it. Sometimes my production will fall off not because the story isn’t working but because I’m too distracted to concentrate properly, or I’m emotionally exhausted. At these times, I need to “refill the well” by listening to music I find deeply stirring and emotional, or reading quotes or poems that resonate with me, or watching movies. The musical score from Les Miserables fires me up every time. Same with Phantom of the Opera. Or I watch my favorite movie, Last of the Mohicans. That emotional scene where the hero (played by Daniel-Day Lewis) is forced to leave the heroine (played by Madelyn Stowe) behind at the waterfall never fails to rejuvenate me. Taking a break to be with people helps, too. Laughter is a general cure all. I’ve learned not to overreact when I run into a difficult patch, because panic only makes it more difficult to fight through it. Occasionally, all I need to do is sleep. Somehow, my subconscious continues to mull over the problem–and when I get up in the morning, the path is once again clear. Hallelujah! I’m honestly not sure I have a least favorite part. I absolutely love what I do. Maybe I’d have to say…revisions? I like them after I’m done with them, because they never fail to improve the story, and that’s always my goal. But they can be daunting if I’m behind or if I’m not sure how to accomplish various parts. 5. If we came to your house for dinner, what would you prepare for us? Something from my new cookbook, LOVE THAT! BRENDA NOVAK’S EVERY OCCASION COOKBOOK (all the proceeds of which go to diabetes research). Maybe I’d do my Mexican Steak Dinner, since it’s a favorite of mine and very healthy! Work, work, work! LOL Now that my kids are all out of the house, I don’t have homework or sports to break up my day. I don’t even really cook anymore. So, as a workaholic, I just keep mowing through that to-do list. I get up and handle email, and then I start writing. I usually don’t get off my computer until my husband comes home around eight. Then we exercise and spend a little time together. I love all three of those. What’s difficult for me is the RESOLUTION of a novel. I love building the conflict, but unraveling it can be a challenge because I don’t want it to sound too trite. 8. A penguin walks into your office, right now, wearing a sombrero. What does he say to you and why is he here? 9. If you could wave a magic wand, what ill in the world would you solve and why? HANOVER HOUSE is the digital prequel to my new suspense series with St. Martin’s Press. On May 1st, it’ll come out in a box set with 12 other thriller writers—some of my favorite authors—and all the proceeds will go to diabetes research. Look for “Hanover House” in SWEET DREAMS (that’s the name of the collection). Links to Brenda’s website, blog, books, etc. BE SURE TO COME BACK to read more about Brenda, her release, and an excerpt from THIS HEART OF MINE on Wednesday’s Karen’s Killer Book Bench. Happy Reading! **SPECIAL GIVEAWAY**: Brenda is giving away an autographed copy of the first three Whiskey Creek novels, WHEN LIGHTNING STRIKES, WHEN SNOW FALLS, and WHEN SUMMER COMES in a cute little Brenda Novak mini-tote (US or Canada only; outside US or Canada, she’ll provide digital copies of the three books) to one lucky reader who comments on her *Author Peek* Interview or Karen’s Killer Book Bench blogs. Don’t miss the chance to read these books! Thanks, Brenda, for sharing your stories with us! I’ve followed Brenda on Facebook for a while now. Loved these questions and the answers given. Thanks so much for dropping in, Kerry! Thanks for hosting me, Karen! I’m excited to be here. What’s the name of that Mexican restaurant? Mexican is my all-time fav! Someday I’ll get there! Yum! Great interview! I love to read Ms. Novak’s books. I also appreciate all of her efforts to raise money for diabetes research as I have had type 1 for 30 years. Thanks for interviewing a wonderful writer using her talent to accomplish wonderful things! I’m glad you enjoyed Brenda’s interview, Sonya. I, too, love her diabetes support. My stepfather had Type 1 from the time he was ten. Thanks for stopping by, Sonya! I can’t wait for a cure–for you, my son and all the others fighting this terrible disease. Karen, your father must’ve seen a lot of changes in diabetes care. Fortunately, we have better tools now. I feel even worse for people who were diagnosed in earlier years. Sadly, Brenda, my stepfather was one of the “early years”. We only had five years with him when he married my mom. Loved that man! That’s heartbreaking, Karen. I’m so sorry to hear that! It was sad to lose him, but I have a lot of wonderful memories crammed into that five years. I’m happy that they’re making inroads into diabetes now. Modern medicine is finding cures for all sorts of illnesses every day. Bless your work in getting help for diabetes research! I’d even be thrilled to get the artificial pancreas on the market, you know? That would be major, Brenda! Crossing my fingers that happens soon. what a great interview, enjoyed it all. As you know, I love all of your books! I discovered Brenda Novak a few years ago, since then, I have read every book she has written. I personally think that she is the most down to earth, multi – talented person. She personally interacts with all of her Facebook fans, another reason why she is so successful. Connie, I love having the chance to interact with you. You’re a sweetheart–so supportive! Have a great day! Great interview. 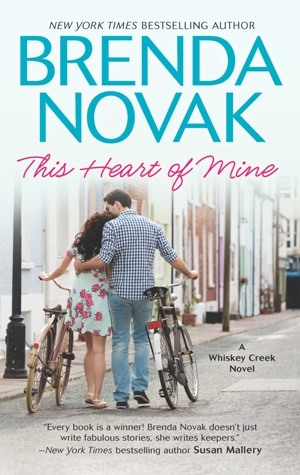 This Heart of Mine is my favorite Whiskey Creek book. Her other novels are good reads also. The money she raises for Diabetes is another one of her good works. Thanks so much, Karen! I’m excited to see how this year’s fundraiser turns out. My fingers are definitely crossed!! I love all of Brenda’s books! She is a great author and an outstanding example of a truly great person! A true inspiration to all that know her. What a sweet comment. Thank you so much, Janice! You put a smile on my face! Heather, what a nice thing to say. Thank you. Each book is a lot of work, but at least I love what I do–and I couldn’t do that without you and every other reader. Really appreciate the support! So nice learning about you and your family. I love your books and found the interview very interesting. Fifty books that is something and I am sure with all your other activities it is not easy to find time but your writing is great and I have introduced many of my friends to your books and they too love them. Shelly, there is nothing that can replace word of mouth, so thank you so much for telling your friends about my work. I love to write–and having wonderful people out there like you is what makes it worth all the effort. Fantastic interview! Love your books! Thanks so much, Linda! You’re the best! Love Brenda Novak’s books. Can’t seem to read them fast enough or often enough. Besides being an award winning writer she’s an incredible person who strongly supports diabetes research through her annual fundraiser. Can’t ask for much more than that from an author who is bound to become your favorite. I dare you to read just one of her wonderful books! Caryn, thank you for your fabulous post. You are SO nice. I appreciate the tremendous support you give me in all my efforts! great interviews, I have enjoyed all of the books I have read by this author. Thanks for the chance to win. Thanks so much, Galinda. You’re the best! I love Brenda Novak’s and I have read most of her books. She is such a down to earth good person. I love the questions you asked and her answers just give me more to love about her. My brother has diabetes and I love that she cares about that. I am definitely getting her new cookbook as eating healthy is on my bucket list… Thank you for interviewing her!! You have a wonderful way with words. 🙂 I enjoy your books very much. My Father and most of the family had diabetes. His Father, Brother and Sister-in-law all died due to diabetes with cancer, too. So far altho my Dad does have diabetes, he manages it. He now has issues with dementia, so I keep track of his pills. And I try to keep myself diabetes-free! Chris, I’m so sorry to hear that so many members of your family have been (or are) affected by diabetes. It’s such a struggle, isn’t it? We’ll keep pushing for that cure! I have really enjoyed Brenda’s books and especially the Whiskey Creek series ones that I have read. Always a good emotional read (at the end of the day!) for me! I hope for many more in the future! Thanks so much, Karen! I have about six more planned. So…we’ll see how they do! phantom of the opera is one of my favorite scores to listen to! its the only broadway show i’ve been to, and i find the music inspiring and helps to get the creative juices flowing as well!! so glad we have that in common! 🙂 Love Brenda’s books, i have a pretty good collection of the whiskey creek series… that i will be adding to as well! thanks for sharing! Thank you, Laura. In my early years of writing, when I needed inspiration, PHANTOM and LES MIS would work very time! So I’m with you! I follow Brenda on Facebook and her website both. Love to read her books. They never fail to pull me into the story. I think her answer to the Penguin in the Sombrero is pure Brenda. Enjoyed rading the interview. thanks for having her. thank you for raising money for Diabetes! My mother-in-law died just 3 days shy of her 101st birthday from complications of her Diabetes and she was blind for several years beforehand. I miss her so much! I hope someday soon your efforts on behalf of your son will make juvenile diabetes disappear. Thank you for all you do Brenda! I love your books and I admire your hard work and dedication to teach and reach others who are affected! I’m sorry to hear about your mother, Diane. It’s hard to lose a parent at any age. I hope we’re able to cure diabetes soon, too! Thanks for your support! What a great interview, I really enjoyed reading it. I also have read all of Brenda’s books. She never fails to draw you in to the story, and make you want to read more and more. Brenda also cares about her fans and takes the time to meet each one. Thanks so much, Kay. You’re easy to care about–because you’re so wonderful yourself! Fantastic Interview… My first book by Brenda was part of the Stillwater Trilogy and I was completely hooked. I have read so many of her books and look forward to the new ones. Brenda’s latest Historical Romance “A Matter of Grave Concern” was so amazing I had trouble putting it down. The Whiskey Creek Series, like all of Brenda’s books, will have you begging for more after each story.